I enjoyed Shane and Cora. Shane's all responsible by-the-book cowboy. He works hard and he takes care of the people around him. And Cora. She's doing everything can to create a new, and happy, life for her and her son. They're good solid people. She smiled up at him, then got to her toes and brushed her mouth across his. "What did I get that for?" She grinned up at him. "Guess you're just pretty or something." The romance was entertaining. The two are at odds over this wedding (they both have their reasons) so things could get, erm, lively. 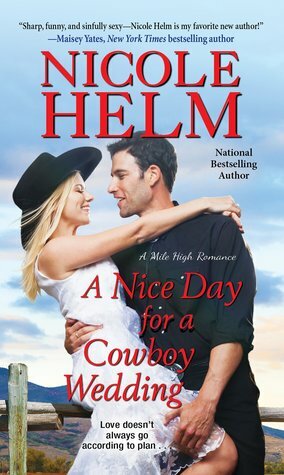 But it also had sweet and funny moments as they dealt with each other and her son started working at his ranch. And heated up nicely, too! There's some family drama, there's some flirty romance, some steam, some healing. I did have a couple little heroine quibbles because of her personality type but overall still enjoyed the read. I do think I'd have been a little more invested had I read the previous 3 books in the series first, though. When Cora Preston worked up the nerve to leave her abusive ex and move with her young son to Gracely, it was a huge step. Accepting the position as wedding planner at brand-new Mile High Weddings took even more courage. 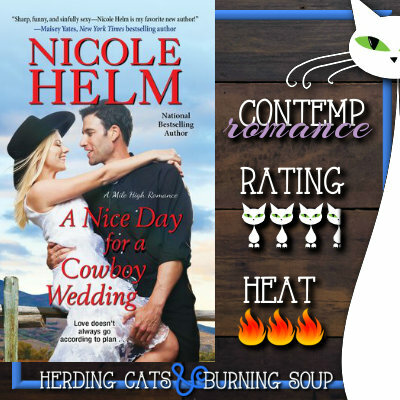 But Cora's biggest challenge is turning out to be the bride's handsome--and stubborn--oldest son, Shane, and the way the strong-willed cowboy makes her feel.